Steal pots of gold and crush shamrocks in this spirited holiday update. Rovio's Angry Birds is without question the App Store's biggest success story. The game cost $140k to develop and has generated $170 million, with over 42 million downloads to boot. On the console side, this newfound wealth would inspire companies to jack up prices at the expense of consumers, which is why we commend Rovio for doing the exact opposite. Instead of sticking it to the buyer, the developer continues to release free content for its wildly popular Angry Birds Seasons. We've already tackled the Halloween, Christmas and Valentines Day updates. Now it's time for St. Patrick's Day. This new download, Go Green, Get Lucky, comes with 18 levels with a grand total of 54 stars to earn. Like the DLC that came before it, this one features levels inspired by the holiday, in this case, good old St. Patrick's Day. Not only do you receive festive music, but also graphics that showcase pigs in black top hats, shamrocks and pots of gold. Of course, the objective remains the same: you must slingshot different types of birds at a series of forts in the hopes of killing those nasty pigs and causing tons of property damage. The more things you destroy, the more points you earn. Doing this takes some skill, as Rovio introduces an array of elements to make things difficult. That said, using the environment to your advantage pays dividends, as you're able to cause chain reactions that result in splintered wood, shattered glass, devastating explosions and even boulders that crush unsuspecting swine. As for the birds, your new feathered friends have various abilities, from breaking off into three critters to dropping egg bombs. Unfortunately, you cannot change the order of birds per level, which makes clearing each stage (and nabbing all three stars) a bit difficult. At least you can restart on the fly. 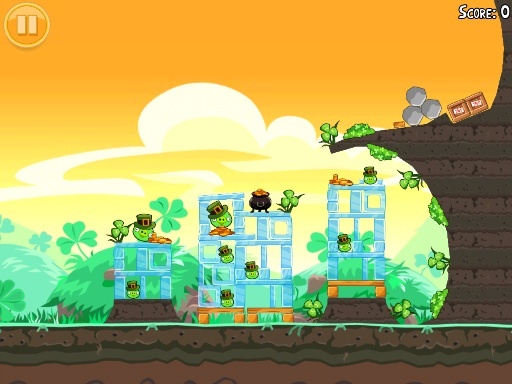 Finally, if you somehow get through these levels quickly, the game lets you send St. Patrick's Day cards to friends on Facebook, similar to the Valentine's Day setup. 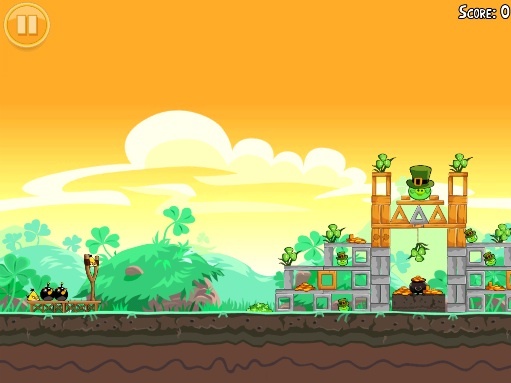 Bottom line, Angry Birds Seasons: Go Green, Get Lucky is a fine update to an already outstanding game, and since it's free, you have little reason to avoid it. Besides, you'll need something to play on that long train ride home, post St. Patrick's Day.